Always on the lookout for imaginative and yes, even quirky, decorating ideas, a magazine photo spread featuring a Boston beach cottage grabbed my attention several months ago. Hanging from the 12 foot high open beam ceiling in the master bedroom was a full size boat – actually a 12 foot racing skiff- mounted upside down complete with oars, refurbished paint and teak railings. Talk about a “gee whiz” focal point for a room! I was quickly able to visualize how a similar nautical approach could be equally dazzling in an open, tin-roof outdoor Key West style gazebo. 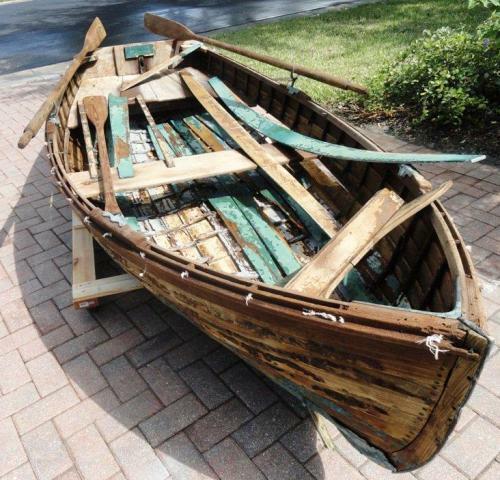 So my husband and I began a search of local marinas and newspaper ads for the “perfect boat” (“perfect” meaning small, lightweight, wooden and extremely old, with classic lines and the potential to be refurbished!) Months passed by with no results, and we began to think that our dream boat just didn’t exist. 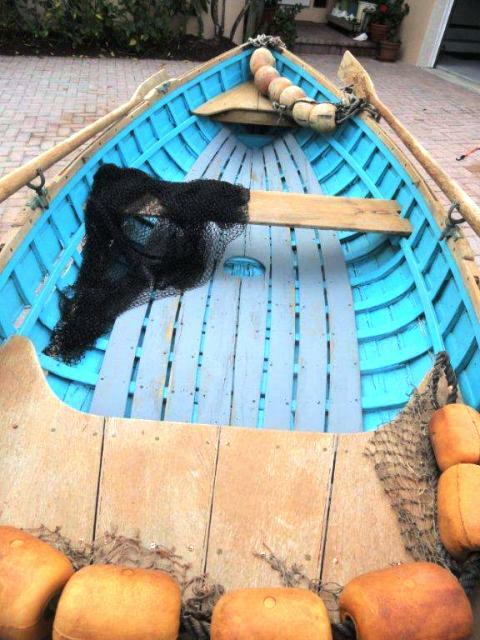 Then suddenly, a newspaper ad offering a “small decorative rowboat that spent many years as a display at a long since - closed Naples seafood restaurant---and not floatable” gave us hope. It was from the northeast, the seller said. We hurried down to the owner’s house. And there, in the dirt underneath her stilt home was the remains of what I was sure used to be one of THE most charming ten foot row boats ever built. If boats had souls – and they may very well have – this one was barely alive. It had sat in the damp soil for years. Huge gashes in the cedar shiplap showed daylight along one side, the walnut seats had collapsed, most of the supporting ribs had rotted away, and several layers of gray and green paint were peeling everywhere you looked. The keel had pushed up along the boat’s center, mis-shaping the floor of the little craft, and the fiberglass that remained on the lower portion of the hull was mostly torn away. My husband looked at me with a “I’m just not sure we can save this---it may be too far gone” expression. And for someone as handy and resourceful as my husband to acknowledge that possibility, well, it was clear that this boat maybe had passed the point of no return. But there was something about it that made us both hesitate. The brass oar locks were intact, the original oars lay off to the side, and it met all the criteria we had been looking for. My husband ran his hands over the key structural features, as if examining a terminally ill patient. He lifted up the stern to check the weight---and to make sure it would survive even a short trip to a flatbed trailer without collapsing or falling completely apart. After a short pause, we both came to the same realization, that maybe – just maybe - this sad little boat might be brought back to life. And even if we failed, our relatively small investment of the $100 we had negotiated as a purchase price would be worth the challenge and the experience. Several days later, we returned with a trailer and hauled our new acquisition home. The disassembling and cleaning process took days. Hours of pressure spraying and fiberglass removal revealed the enormous task that lay ahead. But the initial cleaning also showed that the curved lines of the boat were still true and unwarped, as well as the beautiful workmanship that had gone into its building, probably in the late 1890’s. I know it was my imagination, but I could almost see a slight smile on the front of the bow once the refurbishing had begun. Anything that could be saved was, and any structural members that needed replacing or reinforcing were carefully attended to.